There is a need to characterise spatial point patterns of ecological plant communities in which a very large number of points exist for many different plant species. 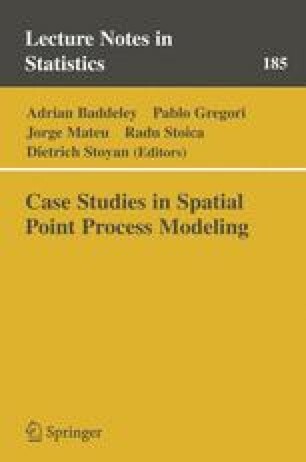 We further investigate principal component analysis for spatial point patterns using functional data analysis tools on second-order summary statistics as introduced in [10, 11]. The approach is used to detect different types of point patterns in a multi-type pattern to classify the species by their spatial arrangement. The developed method is evaluated in a detailed feasibility study, giving rise to a number of recommendations including the choice of the appropriate summary statistic. In addition, we investigate the performance of the method under noisy conditions simulating a number of settings typically occurring in an ecological context. Overall, the method produces stable results, the best results being achieved when the pair-correlation function is used. In all settings the level of noise needs to be very high to invalidate the results.